Offer Details: The complimentary tasting offer does not include private wine cave tastings. Hours: Open Fri – Sun, 11am – 5pm; Private Cave Tastings by appointment only. Grandfather Alipio Paculba planted grapes near Lodi, California in 1940 on a small farm that later spread to 25 vineyard acres. Fruit was mostly sold to wineries, but a young Jones helped separate wine from skins in a basket press as the family made small lots for personal enjoyment. Disseminated among the tasks were lessons about attention to detail and the honor of labor — values forming the cornerstones of his philosophy on life. He worked on the farm through high school and college. Achieving success in the late 1980s tech industry, Jones purchased vineyard property in El Dorado County near road E16 to recreate his grandfather’s tradition. He later added more vines and sold grapes to local wineries. Jones met winemaker Daniel Moore, an early champion of the region who shared his passion for both varietals. Working with likeminded growers, they established the E16 wine program highlighting sustainable vineyards and Moore’s winemaking wisdom. With E16 firmly established among wine critics, the pair focused on making Rhone varietal wines for Jones’ Firefall label from his El Dorado County estate. The name was inspired by a view from the property’s Baby Rattlesnake Vineyard where the sun appears to fall like fire while setting behind the hills to the west. 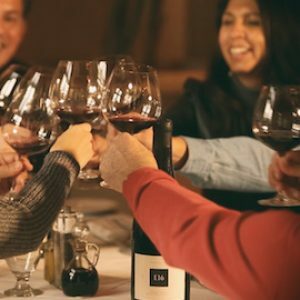 The vineyards of Fair Play and the Russian River Valley are separated by 150 miles and 2,000 feet of elevation, but they are bonded by a commitment to honoring land and tradition with wines expressing a sense of place, longstanding partnerships with growers, and distinction in the bottle.